The perfect accommodation for weddings, family & friend reunions, special birthdays, sport groups, conference accommodation or individuals. There is accommodation to suit everyone's needs. A rural resort where you are given experience, not just a bed and you leave with wonderful memories, not just photos. It is just 1km from Havelock North Village with it's vibrant boutique shopping, cafes, restaurants and wineries. The 6 private cottages are set on 5 acres with petting animals adorning the paddocks. It has an adventure playground and a heated swimming pool. Ideal for a couple (Studio Unit) or a family of 6 in the 3 bedroom cottage or perfect for a group of up to 24 guests in all the cottages. The stunning 8 bedroom Lodge is set on a 5 acre working orchard and sleeps up to 20 guests. 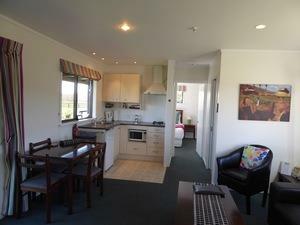 It has a large central lounge, dining, kitchen area and the dining table seats 20 comfortably. It has an all weather tennis court, basketball backboard, volleyball and badminton nets etc. This is perfect for friends, family or business colleagues wanting to stay under one roof. The Cottages & Lodge can sleep up to 48 guests in total.